The Chocolate Fountain Hire Team went in many different directions on this Bank holiday weekend, but I went to Chichester Golf Club and the wedding of Becky and Andy. It was a lovely place, nice and quiet and rural! The bride and groom had a ordered the usual selection of dips, with one exception, chillies! So the team gave them chillies! We had one bowl of large mixed green and red chillies and one bowl of birds eye chillies (hot hot hot!!) The brides father got stuck into eating the large ones, and very soon the chaps were eating the small ones, followed up with marshmallows to try and calm their mouths down!! Good fun had by the watchers! The rest of the guests got stuck into the more tradition cookies, fresh juicy strawberries, plump fluffy marshmallows and exotic sliced kiwi covered in warm chocolate and really enjoyed it! We illuminated our fountain display to match the wedding colour themes, we can light the fountain up in lots of different colours and we can even change the colour at the event so if you change your mind we can too! We display the dips in elegant china all around the illuminated surround and we keep them topped up with fresh delicious dipping items throughout your hire period! This means that your first guest should have the same range of choices as the last! And of course we make sure the chocolate remains topped up throughout the night too and flowing in perfect chocolate curtains! A stunning and utterly delicious sight to behold! For more information on the party hire services we can provide in Chichester click here. On a sunny day in October the Chocolate Fountain Hire Team travelled to Sussex to the picturesque village of Faygate, nestled in the middle of the woodlands is a stunning village hall and was the venue for the wedding we provided our large 5 tier chocolate fountain at. We set up the fountain in the bar area opposite where the delicious smelling hog roast was being prepared. The fountain stands around 7 foot tall on top of a table and we illuminated our surround in a soft purple colour to match the shabby chic decorations in the room. We can light this up in many different colours to perfectly compliment your colour theme. As the milk chocolate started to flow a small gathering of children crowded round eager to have a taste! We supplied a tasty mix of dipping items including mini donuts, chocolate brownie, yummy marshmallows and fresh delicious strawberries! For more information on chocolate fountain hire in Sussex click here. One of the benefits of owning a chocolate fountain hire company is getting to visit great places all over the UK and this was a case for a recent booking where we were invited to visit Margate to provide a chocolate fountain for a black tie ball. We arrived at Morgans in the early evening on a glorious day and set up the fountain between the guests having their evening buffet and having some dancing lessons in one of the upper rooms. We took the opportunity to take in some of the amazing views that Margate has to offer before starting work. When the guests came down to use the fountain we were practically overun with guests keen to sample the dips we had to offer. The fountain was very popular but eventually it was time to get dancing so the guests went upstairs to dance the evening away while we packed away the fountain and headed home. For more information on chocolate fountain hire or our additional services in Margate click here. Does chocolate make you clever? Eating more chocolate improves a nation’s chances of producing Nobel Prize winners – or at least that’s what a recent study appears to suggest. But how much chocolate do Nobel laureates eat, and how could any such link be explained? 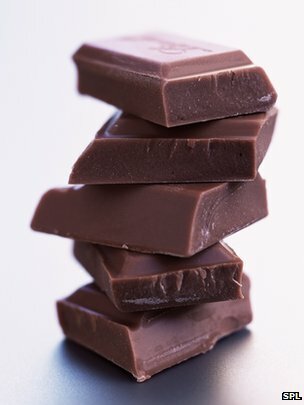 The study’s author, Franz Messerli of Columbia University, started wondering about the power of chocolate after reading that cocoa was good for you. One paper suggested regular cocoa intake led to improved mental function in elderly patients with mild cognitive impairment, a condition which is often a precursor to dementia, he recalls. “There is data in rats showing that they live longer and have better cognitive function when they eat chocolate, and even in snails you can show that the snail memory is actually improved,” he says. So Messerli took the number of Nobel Prize winners in a country as an indicator of general national intelligence and compared that with the nation’s chocolate consumption. The results – published in the New England Journal of Medicine – were striking. “When you correlate the two – the chocolate consumption with the number of Nobel prize laureates per capita – there is an incredibly close relationship,” he says. “This correlation has a ‘P value’ of 0.0001.” says Messerli. This means there is a less than one-in-10,000 probability of getting results like these if no correlation exists. It might not surprise you that Switzerland came top of the chocolate-fuelled league of intelligence, having both the highest chocolate consumption per head and also the highest number of Nobel laureates per capita. Sweden, however, was an anomaly. It had a very high number of Nobel laureates but its people consumed much less chocolate on average. Messerli has a theory: “The Nobel prize obviously is donated or evaluated in Sweden [apart from the Peace Prize] so I thought that the Swedes might have a slightly patriotic bias. We conducted our own, entirely unscientific, survey to ascertain just how much chocolate Nobel laureates ate. Christopher Pissarides, from the London School of Economics, reckons his chocolate consumption laid the foundations for his Nobel Prize for Economics in 2010. “Throughout my life, ever since I was a young boy, chocolate was part of my diet. I would eat it on a daily basis. It’s one of the things I eat to cheer me up. However, Rolf Zinkernagel – the largely Swiss-educated 1996 Nobel Prize winner for medicine – bucks his national trend. 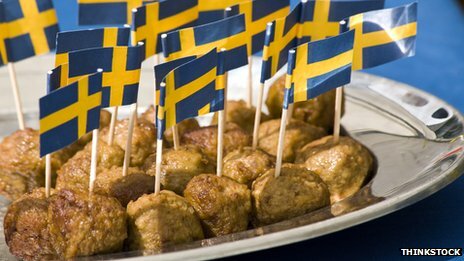 Swedes eat only half as much chocolate as Germans but the country has twice as many Nobel laureates per head… perhaps it’s down to the meatballs? “I am an outlier, because I don’t eat more than – and never have eaten more than – half a kilogram of chocolate per year,” he says. Robert Grubbs, an American who shared the Nobel Prize for Chemistry in 2005, says he eats chocolate whenever possible. “I had a friend who introduced me to chocolate and beer when we were younger. I have transferred that now to chocolate and red wine. But this is a controversial subject. But when More or Less contacted him to elaborate on this comment, he changed his tune. “I deeply regret the rash remarks I made to the media. We scientists should strive to maintain objective neutrality and refrain from declaring our affiliation either with milk chocolate or with dark chocolate,” he said. It might surprise you that we are trying to make a serious point. This is a classic case where correlation, however strong, does not mean causation. Messerli gave us another example. In post-war Germany, the human birth rate fell along with the stork population. Were fewer storks bringing fewer babies? The answer was that more homes were being built, destroying the storks’ habitat. And the homes were small – not the sort of places you could raise a large family in. “This is a very, very common way of thinking,” he says. 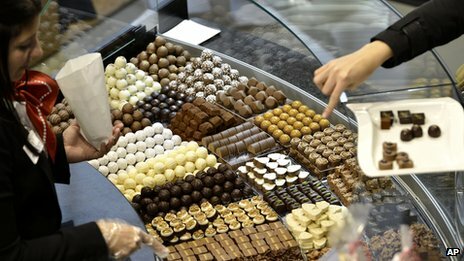 Chemists have found a new way to halve the fat of chocolate using liquids which does not change the “mouthfeel”. Low-fat preparations of chocolate are well known, but their textures tend not to match the real thing. A report at an American Chemical Society meeting described a method using the popular gelling agent agar to make tiny “sponges” that displace fat. University of Warwick researchers said water, fruit juice or even alcohol could replace up to half the fat. When used with alcohol, Stefan Bon said they were like “tiny vodka jellies”. What has held up such chemistry is making what is known as an emulsion – a thorough blend of materials that do not tend to mix, such as oil and water. Normal chocolate gets much of its velvety feel from an emulsion of fat globules suspended within the solid. Replacing those is tricky – any substitutes have to remain dispersed throughout the chocolate as it is heated and cooled to a solid, and they have to remain small. Dr Bon said that the smooth texture of chocolate requires that the globules be smaller than about 30 millionths of a metre across – about half the width of a human hair. The Warwick team first published an attempt to crack the problem in a 2012 paper in the Journal of Materials Chemistry. That formulation made “armoured” spheres of liquid, using two materials – fumed silica, a form of the same material from which sand is made, and chitosan, a compound derived from shellfish. That solution required that the liquid be slightly acidic, so the team used fruit juices. “That was exciting because it had the combination of fruit juice and chocolate, and everybody went wild on it,” Dr Bon told BBC News. The new approach is simpler to carry out and more versatile in the replacements it can employ. It also avoids any concerns consumers may have with the nano-structured fumed silica, or dietary restrictions on eating shellfish products. “So you can stick to your fruit juice if you want, but you can also make a vodka-based chocolate bar, which is exciting – obviously not very healthy, but exciting,” Dr Bon said. On a healthier note, he added that using the method with other liquids could lead to significantly reduced sugar content as well. “It opens the route to different types of confectionery candy that can be placed on the shelf next to everything else that’s out there already,” he said. The chocolate fountain hire team travelled to the lovely Holiday Inn at Elstree to help celebrate the 50th Birthday of Kevin. He chose this specific venue as it is an important place for all his family, not only does he regularly celebrate birthdays there but it is also where he celebrated his wedding a few years previously. We arrived before the guests and set up the stunning 5 tier Belgian milk chocolate fountain. Kevin is a true family man and had treated his guests to a delicious buffet, our decadent chocolate fountain and a vast array of giant outdoor toys! A lifesize “operation” game, huge jenga, massive connect four and an enormous “steady hand buzzer game!”. The children, and adults loved it!! The room was decorated with balloons and photos of Kevin across the years! Guests enjoyed delicious marshmallows, strawberries and profiteroles all drenched in the mouthwatering melted chocolate. For some this was their first time “dipping” but luckily several more expert guests were on hand and soon everyone was enjoying the chocolate! The party goers enjoyed the chocolate, games and music until late into the night with a fantastic night had by all! For more information on the services we provide in London click here. On a brighter than normal Saturday in May the Chocolate Fountain Hire team travelled to the stunning venue of Boxmoor Lodge on the outskirts of Hemel Hempstead. We were providing our stunning 5 tier Belgian Chocolate Fountain as a desert at the reception of Katie and Luke’s Wedding. The marquee was stunningly decorated in purple and ivory with an arch of ribbons and balloons. We arrived after dinner and set up next to the bar area. Within minutes the smell of delicious melted chocolate was filling the room, the youngest guests were desperate for a taste! The Bride and Groom wanted to be the first to try the Chocolate Fountain and after many photographs of just the impressive fountain they were snapped tasting the scrummy treats. The bride then helped the youngest guests offering them chocolate covered marshmallows and strawberries. The remaining guests then took the cue and tucked in, with chocolate brownies, fudge and freshly sliced strawberries being devoured, drenched in delicious melted chocolate! After the tasting the stunning bride and groom took their positions on the dance floor for the first dance. During this and the following songs a videographer was recording messages for the newly married couple. The DJ and dancers took a break while a live singer took over and wowed the guests with his vocal talents. The guests were then treated to a delicious finger buffet including yummy homemade sausage rolls! After a few more dips the guests then went back to dancing the night away with the happy couple! For more information on the services we can provide in Hertfordshire click here. Marie and Neil get married in Style! One of our Saturday night bookings of the Bank Holiday Weekend was in The Hilton in Bristol. It was a wedding that happened late in the evening, the happy couple got married at 5pm and went straight into the evening party! What a great idea! The Bride and Groom entered the beautifully decorated room at 7.30 and cut their cake, had their speeches and then the first dance. We then got inundated with the guests eating the fresh fruit from the two large fruit palm trees. The trees were 7ft tall with real palm leaves in the top. The fruit is strawberries, kiwi, clementines, pineapple, and three different types of melon! Delicious and very pretty to look at! The chocolate fountain was very busy with guests eating the donuts and marshmallows dipped into the smooth creamy Belguim chocolate. It was a great evening and when we left, the party was still in full swing! For more information on the services we can provide in the Bristol area click here. Lea’s Sweet Sixteen at The Four Seasons! At chocolate fountain hire we are often called upon to provide catering for some interesting events. This week we attended one such event. We were asked to provide a chocolate fountain, popcorn machine, candy floss machine and a pick n mix stand! The lucky girl was having a two day birthday celebration at The Four Season Hotel in Canary Wharf in London. We were to provide the snacks for her guests whilst they were watching DVD’s in the room that had been set up to look like a cinema! The pick n mix stand was set up in the ‘cinema’ room and the party goers helped themselves to bags of 20 different types of sweeties, including cola bottles, flying saucers, mini eggs, drumsticks, Maoman and Giant Fried Eggs! We made up lots of bags of candy floss and left on the table. We made two types of popcorn, sweet and salty and put it into cones. The chocolate fountain was set up with strawberries, chocolate brownies, marshmallows and profiteroles. The friends of Lea had a great time tucking in and watching the film. For more information on the services we can provide in London click here. Another busy weekend in the world of chocolate fountain hire saw us heading allover the countryside. One such booking took place in the historic naval City of Portsmouth. Diane and Lee’s wedding reception took place in the Inn Lodge Hotel which is situated on the outskirts of Portsmouth. We arrived and set up the chocolate fountain to be ready in time for the guest to have their main meal, the room was beautifully decorated in pink and white and we colour coordinated the illuminated base accordingly. A lot of the wedding guests were keen to finish their meal and start using the chocolate fountain! After the bride had her first dip on the chocolate fountain the guests needed no encouragement to dip from the chocolate fountain. The bride had chosen a selection of dips including strawberries, grapes doughnuts and meringues. It was great to see so many guests making use of the chocolate fountain! Eventually it was time to pack up the chocolate fountain and leave the wedding guests in Portsmouth to enjoy the rest of their evening. For more information on the services we can provide in Portsmouth click here.